Earlier this month U.S. Senate candidate Hillary Rodham Clinton for the first time edged ahead of New York mayor Rudy Giuliani in a tight race that has attracted national attention. The results of a CBS News/New York Times poll — since confirmed by other polls — showed Clinton leading Giuliani by 49 to 41 percent among likely voters, with 7 percent undecided. Giuliani’s dip in the polls, in part, reflects his cavalier response to the fatal police shooting of Haitian immigrant Patrick Dorismond, an unarmed security guard, in a drug sting operation gone awry. Thus, it is likely that Giuliani eventually will close in on Clinton. Polls change — and will continue to fluctuate with the waxing and waning fortunes of the candidates in this closely contested race — but character is a constant. From this perspective, the only significance of poll numbers is that — somewhat analogous to an electrocardiogram in a stress test — they provide a running record of the political pulse of the voting public as it responds to the palpitations of the candidates’ personality patterns in their race for the prized Senate seat. The fact of the matter is that both Clinton and Giuliani have questions of character and temperament dangling over their heads. As the clock ticks toward November’s election, the debate about whether the two candidates have the right stuff for serving in the Senate, and the effects of character and personality on leadership performance, is bound to intensify. The operative question is this: What kind of candidate will voters be willing to place in the seat of power? In Clinton, as in Giuliani, we have an exceptionally dominant, and potentially aggressive, personality — even by Washington standards. 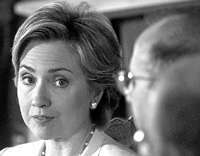 Clinton’s “It takes a village” persona notwithstanding, the Daily News’ revelation is hardly surprising, given our assessment of Clinton: a primarily dominant, controlling individual with highly ambitious, narcissistic qualities — qualities that account for substantial self-confidence but readily shade into arrogance, a sense of entitlement, and an air of superiority. On a more positive note, we also found Clinton to be highly organized, persistent, and conscientious. In short, what we have in Candidate Clinton is a controlling, competitive, somewhat disagreeable individual with little inclination for kindness, yet highly disciplined and dedicated, if somewhat closed-minded and inflexible. Theodore Millon, the distinguished contemporary personality theorist, asserts that dominant personalities enjoy the power to direct others and to evoke obedience and respect from them. They tend to be tough and unsentimental, and derive satisfaction from acts that dictate and direct the lives of others. Although many sublimate their power-oriented tendencies in publicly approved roles and vocations, their controlling inclinations become evident in occasional intransigence, stubbornness, and coercive behaviors. Overall, these personalities tend to be emotionally stable and conscientious, and often make effective leaders. Another expert, Stephen Strack, notes that dominant, forceful personalities have an assertive, tough-minded personal style and are strong-willed, ambitious, competitive, and driven to excel, working hard to achieve their goals. Clearly, there is broad agreement among experts about the existence of a dominant, forceful character type, and abundant evidence that Clinton fits this mold. She likes to be in charge and has the ability to present her ideas authoritatively to the public. However, several layers of concern are revealed if one probes beneath the public veneer of idealistic concern common among politicians. Millon’s theory illuminates the darker recesses of Clinton’s dominant, controlling character type: a penchant for perceptual and cognitive distortion; a demeaning of affection and cooperative behavior; and the creation of realistic antagonisms. First, beneath their controlled exterior, these individuals may harbor an undercurrent of anger and resentment that renders them somewhat thin-skinned and sensitive to others’ reactions. When misconstrued, minor slights become major insults and slander. Moreover, these personalities are short on spontaneity and reluctant to express warm or tender feelings. Fundamentally, they are not softhearted, sympathetic, or caring. Finally, they are inherently antagonistic, and easily provoked to anger. The truth of the matter is that Clinton’s personality dynamics prompt and perpetuate an incessant desire to pursue a fight. Furthermore, these personalities enjoy tangling with others to test their mettle and prove their strength. Ominous though these qualities may sound, they are quite common among successful politicians. What we find of more concern is the primacy of these traits in a personality that claims Eleanor Roosevelt as a role model and professes empathy, caring, and compassion. Hillary may be liberal, but she’s no bleeding heart. Her campaign strengths are her relentless drive and commitment, her commanding presence, her persuasiveness, her unshakable confidence, and her ability to juggle multiple responsibilities. Her Achilles’ heel is hostility and a lack of flexibility, warmth, and congeniality. In power, Clinton will run a tight ship — a leadership style that will leave those stranded who fail to follow. In stormy waters, her manner may incite a mutiny or force followers to jump ship. Perhaps that is not the ideal formula for success in the world’s greatest deliberative body, but then again, perhaps a Senate seat was never intended to be more than a temporary harbor en route to greater conquests. Aví Bahadoor is a junior biology/pre-med major from Trinidad and Tobago, West Indies. She is collaborating in leadership studies conducted by Aubrey Immelman, associate professor of psychology at the College of St. Benedict and St. John’s University, in the Unit for the Study of Personality in Politics.